Domicile and Diaspora investigates geographies of home and identity for Anglo-Indian women in the 50 years before and after Indian independence in 1947. The first book to study the Anglo-Indian community past and present, in India, Britain and Australia. The first book by a geographer to focus on a community of mixed descent. Investigates geographies of home and identity for Anglo-Indian women in the 50 years before and after Indian independence in 1947. Draws on interviews and focus groups with over 150 Anglo-Indians, as well as archival research. Makes a distinctive contribution to debates about home, identity, hybridity, migration and diaspora. Alison Blunt is Reader in Geography at Queen Mary, University of London. She is the author of Travel, Gender and Imperialism (1994), the co-author of Dissident Geographies (2000), and the co-editor of Writing Women and Space (1994), Postcolonial Geographies (2002) and Cultural Geography in Practice (2003). She was awarded the Gill Memorial Award by the Royal Geographical Society with the Institute of British Geographers in 2002 and a Philip Leverhulme Prize in 2003. 1 Domicile and Diaspora: An Introduction. 2 At Home in British India: Imperial Domesticity and National Identity. 3 Home, Community and Nation: Domesticating Identity and Embodying Modernity. 4 Colonization and Settlement: Anglo-Indian Homelands. 5 Independence and Decolonization: Anglo-Indian Resettlement in Britain. Britishness, Whiteness and Mixed Descent. Documenting Paternity and Recolonizing Identity. Embodied Identities and the Limits of Familiarity. 6 Mixed Descent, Migration and Multiculturalism: Anglo-Indians in Australia since 1947. Anglo-Indian Migration in the Wake of HMAS Manoora. From White Australia to Multiculturalism. 7 At Home in Independent India: Post-Imperial Domesticity and National Identity. Anglo-Indian Women in Independent India. 8 Domicile and Diaspora: Conclusions. Appendix 2 Interviews and Focus Groups. 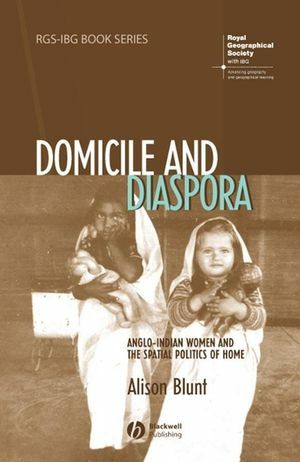 "This is an accessible and clearly written book and would be useful for advanced undergraduate and postgraduate courses on cultural and postcolonial geographies"
"Alison Blunt's latest offering Domicile and Diaspora: Anglo-Indian Women and the Spatial Politics of Home provides a rich and flavourful repast of the betwixt and in-between people of part-British and part-Indian descent... Blunt delivers a cogent, deeply historicized, and creatively theorized account of the cultural and spatial contours of Anglo-Indian domesticity."